Handmade Handlebars, Art, and Shooting Accessories from a Small American Business. Zombie Performance ORIGINAL 6-BEND CUSTOM PULLBACKS! Weird, Curvy, Comfy, and Narrow! 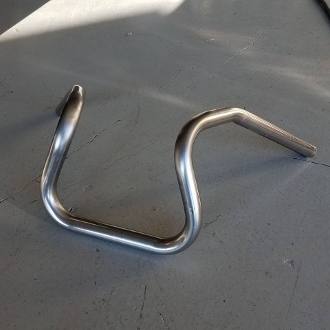 This is a clamp style 6 bend handlebar that does not have the added width common to most clamp style handlebars. 1in or 7/8's .120 wall tube. * Please allow extra time for powdercoating, knurling, stainless steel, or any wiring mods. Copyright © 2009-2019 Zombie Performance. All rights reserved. Bare steel finish. Perfect for you to paint, let rust, or send off from chrome plating locally. Bushed stainless finish, will not rust. Easy to clean or polish locally. Semi Gloss black powdercoating. Our standard black. Easy to maintain and works well with many different shades of blacks. Glossy black with a lot of shine. - For late model HARLEY DAVIDSONS that require the handlebars to be dimpled so that your switch housing wiring harness can exit your hand controls and run EXTERNALLY to the handlebar tubing. This is a standard mod required for MOST late model (evo and newer) Hd motorcycle that did not come with Internal Wiring. - IF YOUR BARS ARE CURRENTLY INTERNALLY WIRED YOU DO NOT NEED DIMPLES ADDED UNLESS YOU PLAN ON THE NEW BARS HAVING EXTERNAL WIRING. - For late model HARLEY DAVIDSONS that allows you to run the handlebar wiring INSIDE the handlebar tubing. - Grip Holes are drilled 6in from the end of the grips. On clamp style bars the center hole is drilled at the bottom of the handlebar centered with where your clamps will mount the handlebars. Riserless Bars will have the holes drilled at the bottom of the uprights above the riser bosses. - FOR INTERNAL WIRING MODS ON NON-HARLEY DAVIDSON BIKES PLEASE EMAIL ME PRIOR TO PLACING AN ORDER. - IF YOU CHOOSE TO HAVE YOUR NEW BARS INTERNALLY WIRED, YOU DO NOT NEED DIMPLES ADDED TO THE BARS. - The TBW option is not listed on all handlebar options. If you do not see the TWB option please email me and we can work out the detail PRIOR to placing your order. Not all handlebars can be set up for TBW. - TBW bars will require part or all of the handlebar to be made from a thinner wall tubing to correctly fit the TBW sensor. - Handlebars set up for TBW will be 1/2in shorter on the throttle side and be notched to fit your TBW sensor. - TBW bars are NOT prewired. *IF YOU REQUIRE A DIFFERENT KNURLING SPACING PLEASE EMAIL ME PRIOR TO PLACING AND ORDER.